Photo courtesy of Youtube, with thanks. At face value anyone analysing Gloucestershire’s season would probably see it as a disappointment. Another mid-table finish in the Championship, failure to get out of their group in the One-Day Cup and the Blast ending with a quarter-final defeat. A competition the club were clearly targeting as their best chance of silverware. Those that have followed Gloucestershire this summer in greater detail, however, will know that 2018 has been a season of progress for Richard Dawson’s men despite numerous occasions when it seemed the gods were against them. The club played without an overseas signing in the Championship from May onwards, when Australian Dan Worrall sustained a foot injury. All the while Liam Norwell, 2017’s player of year, was limited to just two first team appearances in his final season for the club before joining Warwickshire. Both players would have greatly enhanced Gloucestershire’s chances of success. David Payne, Kieran Noema-Barnett, George Hankins and Graeme van Buuren also had spells out injured as a squad which is one of the smallest in county cricket, was pushed to its limits. Under the circumstances, Gloucestershire’s players and coaches forged a largely successful campaign with a number of young players emerging, to give fans some real hope for the future. James Bracey continued his rise in his first full season at the club, a century at Lord’s against Middlesex the high point of his season. Miles Hammond, formerly known for his off-spin has taken to his new role as opener rather nicely, and 17-year-old Ben Charlesworth looks a fantastic prospect. All three were involved in a wonderful end to the season for the club in the Championship, with three wins coming from the final five matches, securing fifth place in the table. The West Country side’s best finish since 2011. There was disappointment not to reach Finals Day in the Vitality Blast, after defeat to a Callum Ferguson inspired Worcestershire in the quarter-finals, but some excellent cricket was played during the Group Stages. Ian Cockbain’s magical century against Middlesex and a fabulous comeback bowling effort against Surrey were two highlights. Of course there was also the Cheltenham Festival, which was played out at the height of summer in July. Some supporters labelled it the best edition of the annual event they have ever seen, with both Championship matches going down to the wire on the fourth day. The win over Durham was arguably the best result of the season for the club. Though it would be wrong to say that 2018 was only full of positives. The Royal London One Day Cup, again, ended with a premature exit. 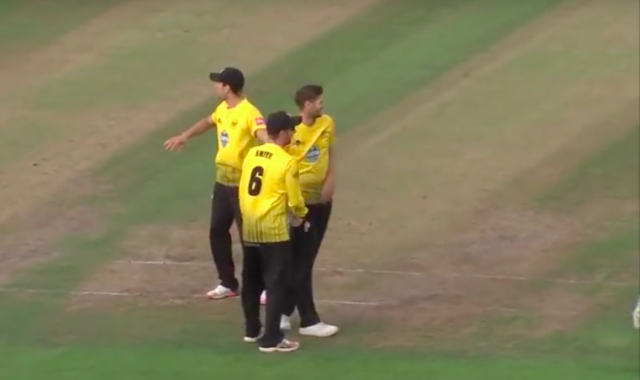 Since winning it back in 2015 Gloucestershire have failed to reach the knockout stages, and while some may point to the three no-results in this season’s tournament as a factor behind the early exit, more games were lost than won and there can be no complaints. Moreover, the batting across all formats remains a concern. A score of 136-8 in the Blast quarterfinal was always going to be a struggle to defend, and it was just one of a few disappointing totals posted throughout the tournament. In the Championship, the top three all enjoyed reasonable summers but the middle-order struggled for consistency throughout, as just 15 batting bonus points were added. There were also a number of big collapses, most notably away at Northamptonshire and Warwickshire, with both games ending in heavy defeats. Despite this, praise must go out to Richard Dawson and Ian Harvey. The pair have taken some harsh criticism at times, which has seemed unfair due to the low budget they are working with, and it’s a doubt there are many that would have been able to do better job. The signing of Ryan Higginshas proved to be an inspired one and the former Middlesex all-rounder is the obvious choice for player of the season. He joined Gloucestershire hoping to play more red-ball cricket and that decision has most certainly paid off. Higgins featured in all 14 of Gloucestershire’s Division Two fixtures and performed excellently, taking 48 wickets with the ball at 18 apiece. His batting tailed off a little as the season went on, but he did register his maiden first class hundred against Durham. He also made an impact in white-ball cricket, 81 his top score in the One Day Cup and his variations helping him to 10 wickets in the Blast. Not many would have predicted back in April that Miles Hammond would be opening the batting for Gloucestershire come the end of the season. His transition has yielded him 476 runs in the Championship, including two centuries and 313 in the Blast, where his explosive style got Gloucestershire off to a flyer on a number of occasions. The 22-year-old has now firmly established himself in his team’s plans for the future, as it was recently announced he has been rewarded with a new two-year contract. This is quite a difficult choice, as nearly all of the Gloucestershire squad contributed at some point during the season, although Graeme van Buuren will have wanted to have made more of an impact over the season. He averaged just 21 in the seven Championship games he played, and has failed to live up to the promise he showed back in 2016, when he first joined the club. A fifty in both innings in the drawn game against Kent was his only meaningful contribution. His opportunities were more limited in white-ball cricket, but when he did get a chance he never really capitalised on it. However the South African has been given a new one year deal for 2019, so it’s clear the club see the potential in him – he just needs to produce more regularly on the pitch. Winning at Bristol remains a big problem for Gloucestershire in red-ball cricket. Just one victory came from their five games at the Brightside Ground, though this is a fact that the players cannot take complete blame for. Pitches at the venue remain slow and conducive to dull cricket. You feel the club as a whole has to come together to try and improve their fortunes at their home ground. This year’s results have had a dampener put on them somewhat by the news that Liam Norwell and Craig Miles are joining Warwickshire. The pair, who came through the Gloucestershire academy, was tempted by the opportunity of Division One cricket. Kieran Noema-Barnett has also left to go back to New Zealand, so the club will be on the lookout for potential new signings. Dan Worrall will return as the main overseas player in the Championship and One Day Cup next season. Worrall may also play some T20 cricket in 2019, depending on the availability of Andrew Tye. Michael Klinger will definitely be involved in that competition, having signed on for another year with the club. This season felt like the start of something special for this Gloucestershire side and was a vast improvement on their 2017 campaign. Players may be leaving, but the development of a number of impressive young players has shown that the club remains on the right track.